Chelsea Park is located on a 13-acre parcel of land at the end of (Chelsea Drive). The grounds encompass a section for biking that is divided into three portions: skills, pump, and creative. The Trans Canada Trail passes directly through the green space, creating a hub of activity. Parking is available on-site. Residents successfully advocated for the development of the bike park and given that Chelsea Drive is so central, it was a prime location to build. 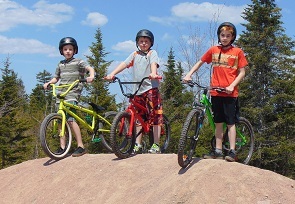 During the construction phase, our parks and facilities department hosted a two day session where the children of Quispamsis were invited to come and help build jumps for the park. When using town parks, please be cautious and do so at your own risk. Regular maintenance is conducted on a seasonal basis, from May to September. During the months of October to April this area is not maintained, monitored or supervised by Town officials.